Fire is the major stand-renewing agent for much of the Canadian forest, greatly influencing forest structure and function. Current estimates are that an average of over 2 million hectares burn annually in Canada ( Stocks et al., 2002). Fire activity is strongly influenced by four factors: weather/climate, fuels, ignition agents and human activities. Recently, our climate has been warming as a result of increases of radiatively active gases (carbon dioxide, methane etc.) in the atmosphere caused by human activities (IPCC 2007). Such warming is likely to have a rapid and profound impact on fire activity in the boreal forests (Soja et al., 2006; Weber & Flannigan 1997). Gillett et al. (2004) use a coupled climate model to show that the observed increases in area burned in Canada during the last 4 decades is the result of human-induced climate change. Additionally, it appears that temperature is the most important predictor of area burned in Canada with warmer temperatures associated with increased area burned ( Flannigan et al., 2005). Numerous research studies have used GCMs to simulate the future climate; these models include three-dimensional representations of the atmosphere, ocean, cryosphere and land surface and the parameterizations of the associated physical processes. Future climate scenarios are built based on the effects of various concentrations of greenhouse gases and other pollutants within the atmosphere on our earth-atmosphere system. Transient simulations are available from GCMs which allow examination of the possible rates of change in the climate. The major areas of uncertainty in GCMs include clouds and their radiative effects, the hydrological balance over land surfaces and the heat flux at the ocean surface. Despite these uncertainties, GCMs provide the best means available to estimate the impact of changes in the future climate on the fire regime at larger scales. Most models predict the greatest warming at high latitudes in winter. Confidence is lower for estimates of precipitation fields but many models suggest an increased moisture deficit particularly in the center of continents during summer. In addition to temperature and precipitation, other weather variables such as atmospheric moisture (e.g., relative humidity), wind, cloudiness, etc. will be altered in a changed climate. The variability of extreme events may also be altered (Mearns et al., 1989; Solomon & Leemans 1997) which could have a significant impact on fire activity as many of the largest fires occur on a few critical days with extreme fire weather (Flannigan & Wotton 2001). Many studies have addressed the impact of climate change on fire weather severity. Flannigan and Van Wagner (1991) compared seasonal fire severity rating values (Seasonal Severity Rating - a rating index to provide a measure of fire control difficulty and is a component of the Canadian Forest Fire Weather Index System) from a 2 × CO2 scenario (mid 21st century) versus the 1 × CO2 scenario (approx. present day) across Canada. Their study used monthly anomalies of temperature and precipitation from three GCMs (Geophysical Fluid Dynamics Laboratory (GFDL), Goddard Institute for Space Studies (GISS), and Oregon State University (OSU)). The results suggest increases in the Seasonal Severity rating across all of Canada with an average increase of nearly 50%, translating roughly into a 50% increase of area burned. Stocks et al. (1998) used monthly data from four GCMs to examine climate change and forest fire potential in Russian and Canadian boreal forests. Forecast seasonal fire weather severity was similar for the four GCMs, indicating large increases in the spatial extent of extreme fire danger in both countries under a 2 × CO2 scenario. Stocks et al. (1998) also conducted a month-to-month analysis, which showed an earlier start to the fire season and significant increases in the area experiencing high to extreme fire danger in both Canada and Russia, particularly during June and July. Flannigan et al. (1998) used daily output from the Canadian GCM to model potential fire danger through the use of the Canadian Fire Weather Index (FWI)(the FWI is a dimensionless relative numerical rating of fire intensity used as a general index of fire danger) for both the 1 × CO2 and 2 × CO2 scenarios for North America and Europe. Most of these studies showed large regional variation in the response of fire weather severity to climate change, ranging from significant increases to regions of no change or decreases in fire weather severity (e.g., Bergeron & Flannigan 1995; Flannigan et al., 2000). Consequences of climate change on fire disturbance must be viewed in a spatially dependent context. Only a few studies have quantified the potential changes in area burned due to climate change. Flannigan et al. (2005) used historical relationships between weather/fire danger and area burned in tandem with two GCMs to estimate future area burned in Canada (Fig. 1). The results suggest an increase of 74 - 118% increase in area burned by the end of this century. Table 1 displays the current trend in fire for the five regions as well as what we anticipate for the near term (2010-2040), medium term (2040-2070) and long term (2070-2100). Note however that 95% of the area burned occurs in the Boreal East and Boreal West regions. Bergeron et al. (2004) discuss implications of a changing fire regime on sustainable forest management in Canada. They find that estimates of future fire activity this century are less than the historical fire activity (pre-industrial) for many sites across the boreal forest and suggest that forest management could potentially be used to recreate the forest age structure of fire-dominated pre-industrial landscapes. There are other factors such as ignition agents, length of the fire season and fire management policies that will likely greatly influence the impact of climate change on fire activity. Ignition probabilities may increase in a warming world due to increased cloud-to-ground lightning discharges (Price & Rind 1994), although they did not account for changes in vegetation, which may greatly influence the lightning ignitions and area burned. 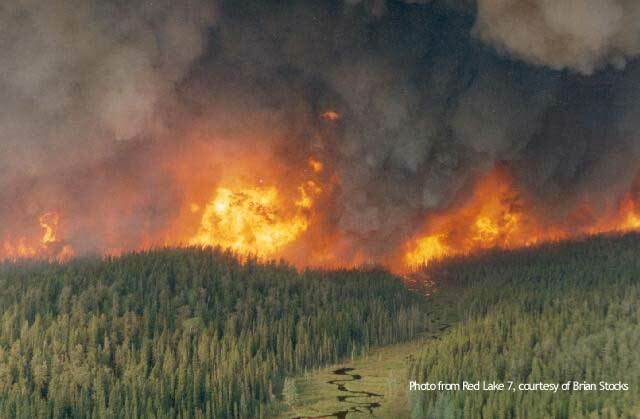 Projected changes in fire weather due to climate change have been used to examine resultant changes in fuel moisture and consequently changes to fire occurrence rates in parts of the Canadian boreal forest. Both human and lightning-caused fires are strongly influenced by moisture in the fuels of the forest floor (Wotton 2007), though both ignite through different processes and should be considered separately in analysis of future fire occurrence potential. Apart from the obvious need for human activity to provide an ignition source, human-caused fire occurrence is most strongly influenced by the receptivity of surface litter to ignition. Wotton et al. (2003) carried out a detailed study of future human-caused fire occurrence using daily projections of fire weather and fuel moisture from two GCMs ( CCC GCM2 and HAdCM2) which showed that while changes in human caused fire occurrence vary spatially across the province, overall a 18% increase is expected by the year 2020 and a 50% increase by the end of the 21st Century. While human-caused fires make up just over 50% of fires occurring in Canada, it is lightning-caused fires that tend to be the major contributor to area burned in the boreal forests of Canada (Stocks et al., 2002). Lightning fire ignition is strongly influenced by moisture content in the organic layers of the forest floor. Wotton et al., (2005) examined lightning fire occurrence using fire weather and fuel moisture scenarios derived from the CCC CGCM2 and found a projected increase in lightning fire activity of 24% by 2040 and 80% by the end of the 21st Century. This analysis used the relatively conservative approach of using monthly anomalies to generate fire weather scenarios (following the method of Stocks et al. 1998), did not account for a lengthening fire season, and did not include changes in lightning activity; thus it was hypothesized that these projected increases in fire activity were quite conservative. The exposure of large areas of previously frozen and wet peatlands to fire is expected to increase significantly as a result of climate change. In addition to the increase in emissions and carbon loss associated with more peatland burning, there is also a growing concern that fires will burn more deeply in exposed organic material, greatly increasing fire suppression difficulties. Much more time and effort would be required to extinguish such fires, thus occupying resources that might otherwise be used to attack new fires. In addition, there is the very real possibility that holdover fires (fires that continue to smolder under snow cover during the winter and reappear the following spring) could become much more common with more peat fires. Climate warming is expected to make fire seasons longer. Wotton and Flannigan (1993) estimated that the fire season length in Canada, on average, will increase by 22%, or 30 days in a 2 × CO2 world. Also, research has suggested that the persistence of blocking ridges in the upper atmosphere will increase in a 2 × CO2 climate (Lupo et al., 1997), which could have a significant impact on forest fires as these upper ridges are associated with dry and warm conditions at the surface and are conducive to the development of large forest fires (Skinner et al., 1999, 2001). Fire management policies and effectiveness will continue to change. Changes in prevention programs, initial attack capabilities and restricted access/fire restriction policies will influence potential fire activity in this century. These other factors are all confounding effects that may dampen or amplify the impact of a changing climate on the fire regime. Fig 1. Ratio of 3xCO2/1xCO2 area burned by Ecozone using the Canadian and Hadley GCMs, respectively. N/A, not applicable. The area burned model did not work for one ecozone. Bergeron Y, Flannigan MD (1995) Predicting the effects of climate change on fire frequency in the southeastern Canadian boreal forest. Water, Air, Soil Pollution, 82, 437 - 444. Bergeron Y, Flannigan M, Gauthier S et al. (2004) Past, current and future fire frequency in the Canadian boreal forest: Implications for sustainable forest management. Ambio 33, 356 - 360. Flannigan MD, Bergeron Y, Engelmark O et al. (1998) Future wildfire in circumboreal forests in relation to global warming. Journal of Vegetation Science, 9, 469 - 476. Flannigan MD, Logan, KA, Amiro BD et al. (2005) Future area burned in Canada. Climatic Change, 72,1-16. Flannigan MD, Stocks BJ, Wotton, BM (2000) Forest fires and climate change. Science of the Total Environment, 262, 221 - 230. Flannigan MD, VanWagner CE (1991) Climate Change and wildfire in Canada. Canadian Journal of Forest Research, 21, 66 - 72. Flannigan, MD, Wotton BM (2001) Climate, weather and area burned. In: Forest Fires: Behavior & Ecological Effects (eds Johnson EA, Miyanishi K) pp. 335 - 357. Academic Press, New York. Gillett NP, Weaver AJ, Zwiers FW et al. (2004) Detecting the effect of climate change on Canadian forest fires. Geophysical Research Letters, 31, L18211, doi:10.1029/2004GL020876. IPCC (2007) Climate Change 2007: Impacts, Adaptation and Vulnerability. Cambridge University Press, Cambridge, UK. Lupo AR, Oglesby RJ, Mokhov II (1997) Climatological features of blocking anticyclones: A study of the Northern Hemisphere CCM1 model blocking events in present-day and double CO2 concentration atmosphere. Climate Dynamics, 13, 181-195. Mearns LO, Schneider SH, Thompson SL et al. (1989) Climate variability statistics from General Circulation models as applied to climate change analysis. In: Natural Areas Facing Climate Change (ed Malanson GP), pp. 51 - 73. SPB Academic Publishing, The Hague. Price C, Rind D, (1994) The impact of a 2×CO2 Climate on lightning-caused fires. Journal of Climate, 7, 1484 - 1494. Skinner WR, Flannigan MD, Stocks BJ et al. (2001) A 500 mb synoptic wildland fire climatology from large Canadian forest fires, 1959-1996. Theoretical and Applied Climatology, 71, 157 - 169. SkinnerWR, Stocks BJ, Martell DL et al. (1999) The association between circulation anomalies in the mid-troposphere and area burned by wildland fire in Canada. Theoretical and Applied Climatology, 63, 89 - 105. Soja AJ, Tchebakova NM, French NHF et al. 2006. Climate-induced boreal forest change: Predictions versus current observations. Global and Planetary Change, doi:10.1016/jgloplacha.2006.07.028. Solomon AM, Leemans R (1997) Boreal forest carbon stocks and wood supply: Past, present and future responses to changing climate, agriculture and species availability. Agricultural and Forest Meteorology, 84, 137 - 151. Stocks BJ, (1991) The extent and impact of forest fires in northern circumpolar countries. In: Global Biomass Burning: Atmospheric, Climatic, and Biospheric Implications (ed Levine JS), pp. 197-202. MIT Press, Cambridge, MA. Stocks BJ, Fosberg MA, Lynham TJ et al. (1998) Climate change and forest fire potential in Russian and Canadian boreal forests. Climatic Change, 38, 1-13. Stocks BJ, Mason JA, Todd JB et al. (2002) Large forest fires in Canada, 1959-1997. Journal of Geophysical Research, (D) 107, 8149, doi:10.1029/2001JD000484. Weber MG, Flannigan MD (1997) Canadian boreal forest ecosystem structure and function in a changing climate: Impacts on fire regimes. Environmental Reviews. 5:145-166. Wotton BM (2007). Interpreting and using outputs from the Canadian Forest Fire Danger Rating System in research applications. Environmental and Ecological Statistics, (in press). Wotton BM, Flannigan MD (1993) Length of the fire season in a changing climate. Forestry Chronicle, 69,187-192. Wotton, BM; Logan, K.A. and McAlpine, R.S. 2005. Climate change and the future fire environment in Ontario: fire occurrence and fire management impacts. Ontario Ministry of Natural Resources Climate Research Report CCRR-01.32p. Wotton BM, Martell DM, Logan KA (2003) Climate change and people-caused forest fire occurrence in Ontario. Climatic Change, 60,275-295.